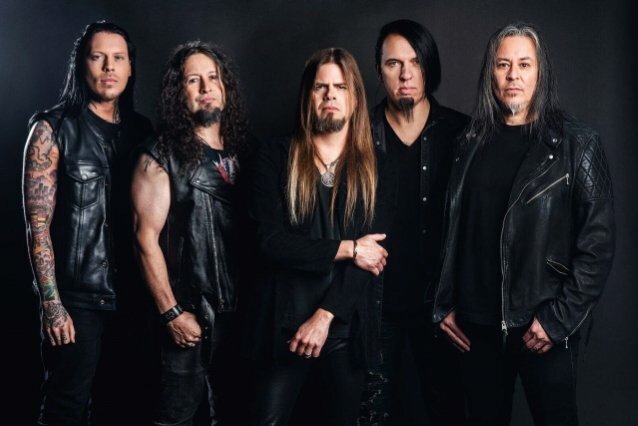 QUEENSRŸCHE will play some of the most renowned European festivals, along with a few club shows, in support of the band's upcoming album, "The Verdict", which will be released on March 1. 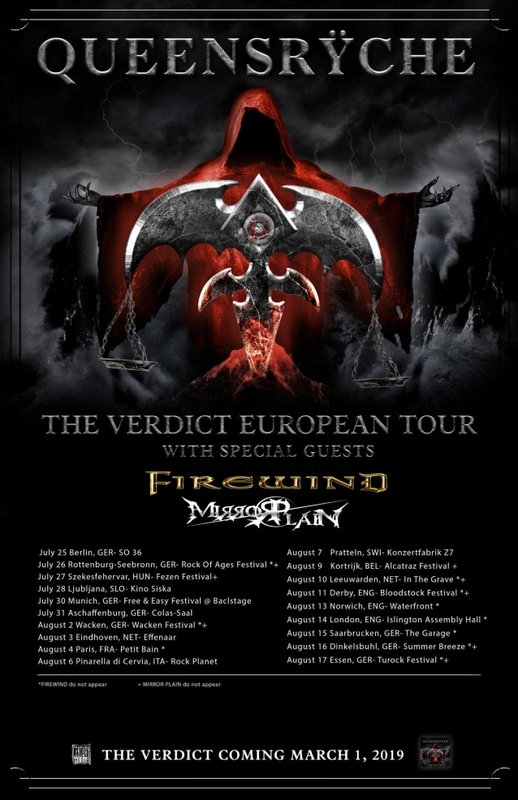 Special guests on the trek will be FIREWIND, with MIRRORPLAIN joining them on select shows. "We are very excited that we will be touring Europe again," says vocalist Todd La Torre. "Really looking forward to seeing you all in support of our new album! Thank you all for your embrace and support." "The Verdict" was produced, mixed, and mastered by Chris "Zeuss" Harris (ROB ZOMBIE, ICED EARTH, HATEBREED) at Uberbeatz in Lynwood, Washington; Planet-Z in Wilbraham, Massachusetts; and Watershed Studio in Seattle, Washington. For the past two years, original QUEENSRŸCHE drummer Scott Rockenfield has been taking time off from the group's touring activities to spend time with his young son, who was born in early 2017. Filling in for him has been former KAMELOT drummer Casey Grillo. Asked by Ultimate Guitar if it's true that La Torre laid down the drum tracks on QUEENSRŸCHE's upcoming album, "The Verdict", guitarist Michael Wilton said: "Yeah, it is. Basically, the songs were in a state of disarray and that includes drums. When we found out that Scott wasn't going to be able to record the drums for this album, it was a natural succession to Todd. Todd has been writing almost all of the drum parts — he wrote most of them for the last two albums and Scott just played what he did and gave his spin on it [live]. So, this wasn't anything new for Todd. It was a just a matter of, during pre-production, hooking up a MIDI drum kit and finished up the drums during that time and it worked out great. We were off in a time crunch schedule and there was no need to seek out a studio drummer or something like that when we have someone who’s able to do it. He's been playing drums his whole life and cutting his chops on QUEENSRŸCHE, so it was a natural succession for Todd, and he pulled it off great." Wilton also talked about the heavier musical direction of "The Verdict" compared to that of 2015's "Condition Hüman". He said: "I think it seemingly oozed out of us and I think it had a lot to do with the band touring so much. We've been touring on the 'Condition Hüman' album for, like, three years. Seeing how the fans react to the music and how we felt about it on stage had a lot to do with how we attacked this new album. It really put a spin on the writing process as well. Because people aren't going to buy the record — they're going to stream it or listen to it on the radio, [we focused on the fact that] we are going to be playing it live all the time. So we wanted to write music that sounds really good live. Being on the road — that's what steered us in that direction. When you're on the road, you have time to play with ideas, so everybody had lots of riffs and everything. So we got a producer who could organize it all. The songs were in a state of non-completion compared to when we went in to record 'Condition Hüman'. So we had all these bits and pieces and pre-production became an extension of the writing process where we were filling in those blanks. Then we had to learn to play it as one piece, and then we had to record it. It was a process that was more like what we used to do back in the '80s." La Torre, who has played drums since the age of 13, recently told Shred Shack that he was the obvious choice to lay down the drum tracks on "The Verdict". "Our original drummer, Scott, he had a baby back in 2017, and he took paternity leave, and he's still kind of been on that leave of absence," Todd said. "So we just continued to keep writing and doing things as a full band, like we've always done. He just wasn't available for this one. I think it all came together pretty seamlessly, actually, and we're looking forward to the release of this record." Asked by a fan on Facebook if Rockenfield's lack of involvement with "The Verdict" means that Grillo will handle the drumming duties for QUEENSRŸCHE in the studio going forward, the band responded: "We're just taking it one day at a time and trying not to look too far ahead. Things are always changing and we can't predict what the future will bring. Right now we're just concentrating on getting this album in the hands of our Rÿchers and touring." QUEENSRŸCHE's spring U.S. headline tour with special guests FATES WARNING will kick off on March 2 in Orlando, making stops in major markets such as New York, Atlanta, Chicago, and Los Angeles, and will wrap on April 3 in Seattle. THE CRINGE will join both bands on select dates.